Rome’s most beautiful street finally has a restaurant worthy of it. This tastefully designed restaurant in neutral tones has sleek modern furniture, a few whimsical ivory Baroque-ish banquettes, and nice lighting that set the stage for excellent dining. 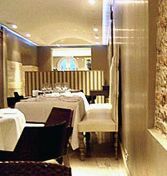 Opened in 2007, this seems set to become a leading seafood venue, since Chef Agostino Petrosino excels at preparing it. The lobster with tiny fried ricotta ravioli was sublime — meaty and sweet from the sea. The sommelier nicely paired each course with wine. A bottle of champagne would have carried the meal through, too. Service is professional and attentive. The chef thoughtfully adjusted the menu for my dining companion who had just been put on a very restrictive diet; the innovative dishes perked him right up. Outdoor dining in the courtyard. In the St. George Hotel.